Details of fund-raising events in 2019 will be posted soon! This year's Christmas Hamper draw, organised by Nick Hall, took place after our Carol Service on Thursday 13 December. There were, again, two hampers won and other, smaller prizes (including a box of special 'Beatles' socks!). Grateful thanks go to not only those who generously provided items for the event but also those who bought and/or sold tickets. The draw raised a marvellous £451 for church funds - a record sum. Many thanks, Nick, for another successful and enjoyable event. 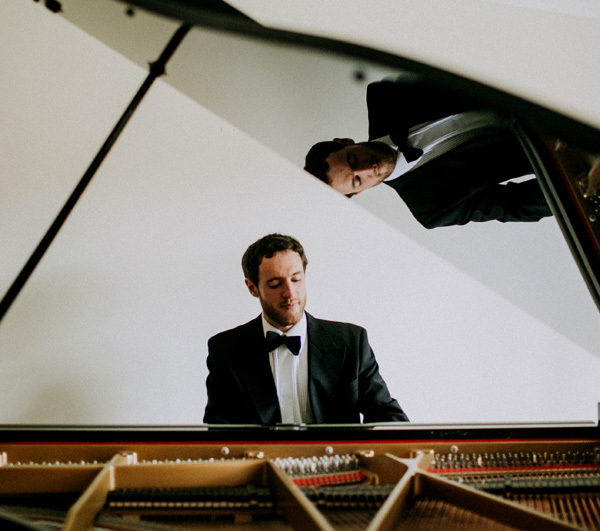 Concert pianist Edward Pick returned to give his second recital in Astley Village Hall on Friday 5 October. His first recital here was in 2015 when he enthralled the audience with a stunning performance of classical pieces. His mixed programme this year included works by Brahms, Debussy and Chopin, followed by a medley of 'easy listening' 20th-century favourites. This was a most enjoyable evening's music with something for everyone, and with an audience of 40 we raised £380.70 for church funds. Edward has promised to return! This popular, annual, National event took place on Saturday 8 September, when across the country cyclists, walkers and riders visited as many churches and chapels as possible between 10 am and 6 pm. The two Astley participants, Nick Hall (on foot) and Martin Locke (on 2 wheels), set off on a wet morning to do the local churches before moving into town to walk the churches in Shrewsbury, rasing a total of £845.00 (less Gift Aid) for the Shropshire Historic Churches Trust. Half the money raised through sponsorship and donations (less Gift Aid) will be returned to St Mary's Church, so a big thank you to all those who supported us this year. This year's Gardens Open on 24 June was held on a lovely summer afternoon and enjoyed by over 200 visitors (adults and children) - 11 from outside the county; it was a truly joyous community event. While we didn’t beat the 2016 record the afternoon raised an impressive £1,932.63 for our church funds. Well done and thanks to those who prepared and opened their gardens and welcomed our visitors. There were numerous favourable comments on the refreshments and cream teas served in the Village Hall so thanks to the dedicated efforts of Kate Lloyd and the catering team who worked tirelessly throughout the afternoon to keep our customers happy. And well done to those who produced an amazing array of cakes and other delights; perhaps we should open a village bakery! Other contributions adding to the day’s success included: programme sellers/visitor recorders and car-park marshals; a well-stocked plant stall run by Liz, Fred and Heather (another business opportunity? ); Margaret’s quizzes and choc-ices (record sales! 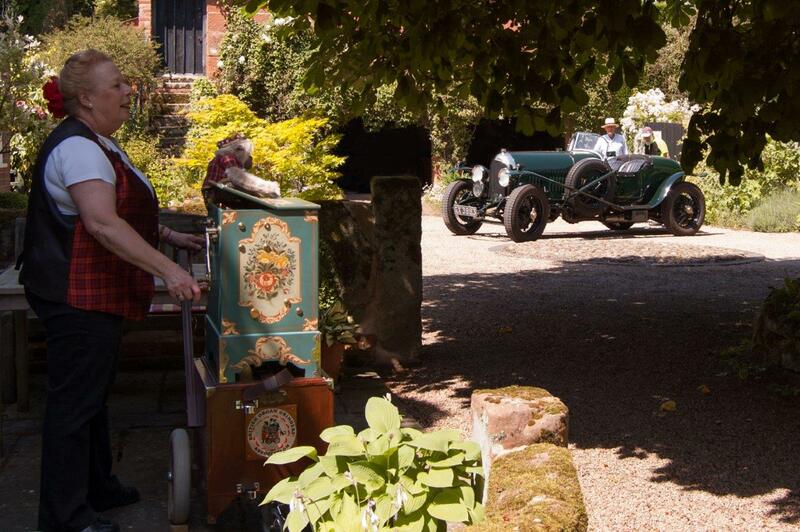 ); Kate Turner’s barrel organ which played throughout; and Andrew Davies’s eye-catching vintage Bentley. Finally, I should pass on our thanks to Tim King for event publicity and all our sponsors - especially Allmark Surfacing Ltd - and to Rob Shelley for again producing the road signs. Will we be as lucky in 2020; who knows? Another fun and successful event! The Folk Evening on Friday 9 March was very well attended by some 70 people in the Village Hall and we all enjoyed the jolly foot-tapping tunes and songs and ballads from the Old Bones trio and Sophie Kerr. Many thanks to Nick for organising and to Heather and Dorothy for doing the raffle, and to all who came and supported the event which raised £570 for church funds. Bells and Whistles 2017 - a great evening! After cancelling the Shrewsbury Hand Bells event in April it was a great pleasure to welcome them back for our Bells and Whistles evening on 20 October to delight an audience of some 35 in the Village Hall. The 'Whistles' element of the evening comprised a fascinating talk by Kathleen Turner who had brought a large array of various musical boxes and small organs, including the one she brought along to the Astley Gardens Open in June 2016. These she illustrated with tunes from yester year played from toothed belts, large discs and punched tapes; we even had a chance to sing along in a music-hall style karioke! As ever, the team of twelve Shrewsbury Hand Bells provided a medley of mellifluous sounds which were a delight to listen to, but a comic interlude on the cow bells aptly demonstrated the three gentlemen players' wit and skill in ringing the changes. Our grateful thanks go to Chris Taylor for running the bar for this enjoyable and successful evening which raised £302 for church funds.